I’ve always liked Tim M. Berra’s books, ever since, in college, I read his Evolution and the Myth of Creationism (1990), a wonderfully clear and succinct refutation of creationism. Berra focused mainly on young-earth creationism, since “intelligent design” wasn’t really on the radar yet, although “intelligent design” proponents now like to give him a hard time about what is admittedly a shaky analogy between the human fossil record and the sequence of Corvette models. Lately, he’s taken to biography, having written a similarly clear and succinct biography of Darwin, Charles Darwin: The Concise Story of an Extraordinary Man (2008)—just the ticket if the sight of Janet Browne’s magisterial but bulky two volumes makes your arms ache in anticipation of holding them to read. That reference to Oscar Wilde’s greatest play reminded me of a silly project that I began and abandoned around the time of Ernst Mayr’s death in 2005. Mayr, of course, was one of the greatest evolutionary biologists of the age, credited with the biological species concept, peripatric speciation, the foundations of modern philosophy of biology, and plenty besides. He was a prolific author, too, writing practically up until the year of his death—What Makes Biology Unique? was published in 2004. And he was a member of NCSE, naturally. It was sad, certainly, to hear of his death, but not entirely unexpected; he was born in 1904, after all. And my thoughts soon turned to what the inevitable posthumous appreciations would look like. Fine, be that way; let’s see if you can do better. Anyhow, it occurred to me that I didn’t really know what—if anything—Wilde thought about Darwin. Born in 1854, he was educated (at Trinity College, Dublin, and Magdalen College, Oxford) in the 1870s, as Darwin’s ideas were still percolating through the British intelligentsia. But my exiguous knowledge of Wilde’s writing—limited to The Importance of Being Earnest and a handful of his other plays, The Picture of Dorian Gray, and a few of his short stories—didn’t suggest that he was particularly interested in biology. Nor did Richard Ellman’s 1988 biography (which I read hot off the press years ago, on a Greyhound bus between Boston and Columbus, Ohio, for reasons that needn’t detain us here) offer any insight on that score. The English mind is always in a rage. The intellect of the race is wasted in the sordid and stupid quarrels of second-rate politicians or third-rate theologians. It was reserved for a man of science to show us the supreme example of that “sweet reasonableness” of which [Matthew] Arnold spoke so wisely, and alas! to so little effect. The author of the Origin of Species had, at any rate, the philosophic temper. [...] Ethics, like natural selection, makes existence possible. Aesthetics, like sexual selection, make life lovely and wonderful, fill it with new forms, and give it progress, and variety and change. Well, that suggests that Wilde admired Darwin a bit, although frankly I don’t quite understand the "ethics is to aesthetics as natural selection is to sexual selection" comparison. That suggestion is confirmed by the sole item in The Letters of Oscar Wilde (1962), edited by Rupert Hart-Davis, to mention Darwin. 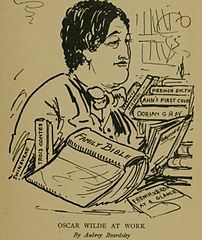 In a letter of January 1889, Wilde thanked W. L. Courtney for sending him his short biography of John Stuart Mill, expressing his lack of interest in Mill by saying “A man who knew nothing of Plato and Darwin gives me very little...but Darwinism has of course shattered many reputations besides his.” Of course, Mill, who died in 1873, knew about Darwin, and devoted a long footnote in later editions of his System of Logic to “Mr. Darwin’s remarkable speculation”; in his posthumously published Three Essays on Religion (1874), he was inclined to reject natural selection in favor of intelligent design. But you get Wilde’s point. The nineteenth century is a turning point in history simply on account of the work of two men, Darwin and Renan, the one the critic of the Book of Nature, the other the critic of the books of God. Not to recognize this is to miss the meaning of one of the most important eras in the progress of the world. Creation is always behind the age. It is Criticism that leads us.